In 1970, drug-fueled Los Angeles detective Larry “Doc” Sportello investigates the disappearance of a former girlfriend. 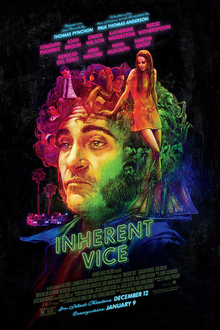 ‘Inherent Vice’ is a 150 minute hallucinogenic trip into the mind of private investigator Larry ‘Doc’ Sportello (Joaquin Phoenix) and the neon infused streets of Los Angeles at the height of the hippie generation in 1970. Adapted by Paul Thomas Anderson from Thomas Pynchon’s ‘unfilmable’ novel, it’s often hilarious, frequently frustrating and almost always confusing! The plot kicks off when Doc’s ex Shasta Fay Helpworth (Katherine Waterston) visits his beach house and asks him to help prevent a plot to abduct and commit her new lover, Mickey Wolfmann (Eric Roberts) to an insane asylum. As well as being a private investigator, Doc smokes a lot of pot and this adds to the fragmented nature of the narrative as Doc’s attempts to piece together his case runs in tandem with the viewer trying to navigate the plot. Along the way, Doc ends up picking up a couple of other cases that intersect with the main case in interesting ways. The film is hilarious throughout, with countless laugh out loud moments that would put outright comedy films to shame. This is mainly filtered through Joaquin Phoenix’s terrific display, and he is a joy to watch in a true tour de force of a performance. He encounters numerous different characters through the course of the narrative of his cases, with Owen Wilson and Benicio Del Toro amongst the actors putting in enjoyable performances. His main foil comes in the form of Josh Brolin’s hippie hating detective, Christian F. ‘Bigfoot’ Bjornsen, an angry man who ends up working alongside Doc on the Wolfmann case. Brolin is also terrific and provides countless laughs, particularly in a great scene in a diner (you may have seen this in the trailer). The film also has a terrific soundtrack, with a couple of tracks from Neil Young working particularly well. In many ways, ‘Inherent Vice’ is one of the most unusual releases of the year – a 2 and a half hour comedy with an extremely challenging, labyrinthine plot that is almost begging for cult status. Cases pile on cases, characters appear, disappear and reappear unexpectedly, with the effect of this perhaps intended to place the viewer inside Doc’s drug addled head. There’s an argument to be made that Anderson could have adapted the novel into a more coherent screenplay, but that would be missing the essence of what makes the story unique. For better or worse, ‘Inherent Vice’ is exactly as it’s meant to be.